Switzerland’s economy slowed more than expected in the third quarter. Will the AUDCHF climb continue? The Reserve Bank of Australia left the interest rate at 1.5% and revised up a little its forecasts for economic growth in 2018 and 2019 at its November 6 meeting. Economic data have mostly been mixed since its last meeting. However while Australian business investment unexpectedly contracted in the third quarter the estimate of total investment through the 2018-19 fiscal year was upgraded to $114.1 billion Australian dollars, up 11.3% from an estimate made three months ago. Meanwhile Switzerland’s economy unexpectedly shrank last quarter: Swiss gross domestic product slid 0.2% on quarter, resulting in a 2.4% growth over year instead of expected 2.9%. Weaker Swiss data are bullish for AUDCHF . 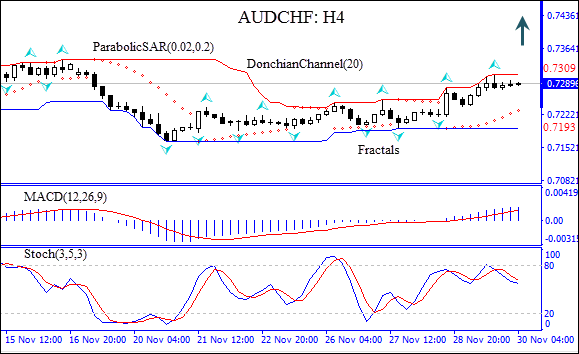 On the 4-hour timeframe AUDCHF: H4 is trading with positive bias after hitting one-month low twenty days ago. The MACD indicator is above the signal line with the gap widening. This is a bullish signal. The Stochastic indicator is falling but has not breached into the oversold zone. We believe the bullish momentum will continue after the price breaches above the upper Donchian boundary at 0.7309. This level can be used as an entry point for placing a pending order to buy. The stop loss can be placed below the lower Donchian channel at 0.7193. After placing the pending order the stop loss is to be moved every day to the next fractal low, following Parabolic signals. Thus, we are changing the expected profit/loss ratio to the breakeven point. If the price meets the stop-loss level (0.7193) without reaching the order (0.7309) we recommend cancelling the order: the market sustains internal changes which were not taken into account.